Smooth, Creamy, and Dreamy. 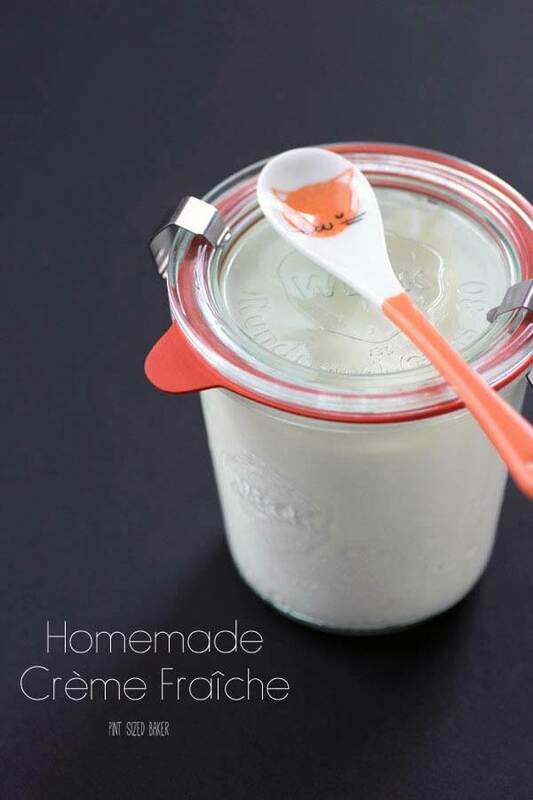 Homemade Crème fraîche just requires two ingredients and some time. It’s a great staple to keep in the fridge. This week, I’ve made a wonderful, gluten-free dessert that everyone will love. Well, everyone but by husband that is. He’s not a big fan of strawberries, so it’s a good thing I made this while he was out of town. This week we start off with Crème fraîche, then I made Strawberry Rhubarb Curd, and I used those to fill some Meringue Cups. 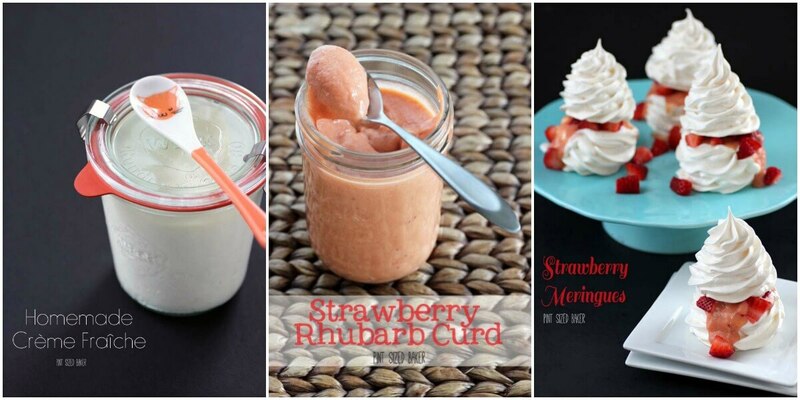 You can also use creme fraiche in place of yogurt in your sweet dishes or sour cream in savory dishes. It’s quite versatile and just requires two ingredients and some time. I had only ever bought creme fraiche. I can’t find it at my local grocery store, but I can get it when I’m at my in-laws and go to Trader Joe’s. This is another specialty dairy item that costs a small fortune. Once you see how easy it is to make, you’ll never buy it again! It’s smooth and tangy and perfect to compliment the tart strawberry and rhubarb curd that I made. If you enjoy the homemade cheeses that I’ve made, this will be a cake walk. Seriously, easy stuff here. I’m not sure how you can mess this up. To view some easy home-made cheeses, check out my Mascarpone Cheese, Ricotta Cheese, and Quark Cheese. I’m sure you’ll find something that you like! This Homemade Crème fraîche is part one of a three part series including Strawberry Rhubarb Curd and Strawberry Meringues. Smooth, tangy, and oh so versatile. 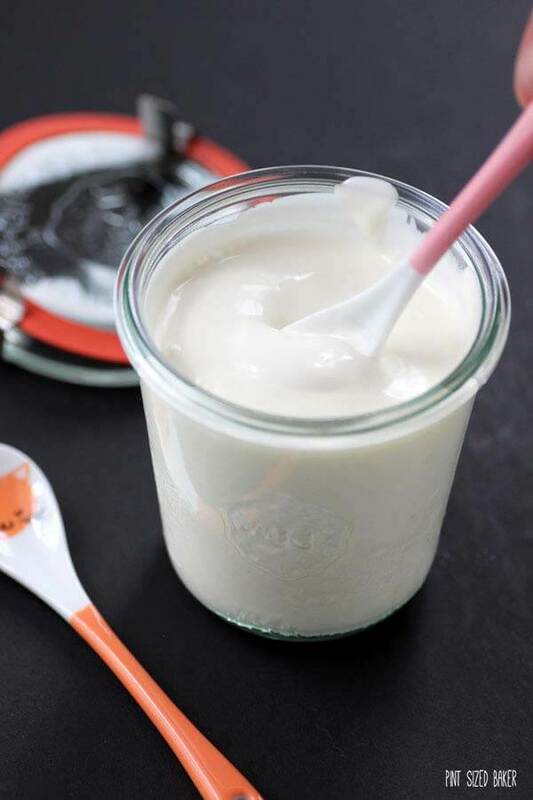 Use Crème fraîche in place of yogurt, whipping cream or sour cream. Warm the cream to about 105℉ in the microwave. Stir in the buttermilk, cover with plastic wrap and let it sit out for 24 to 36 hours. It will thicken to a yogurt like consistency and be tangy. When it reaches the flavor that you like, stir it, transfer it into a clean mason jar and store it in the fridge. 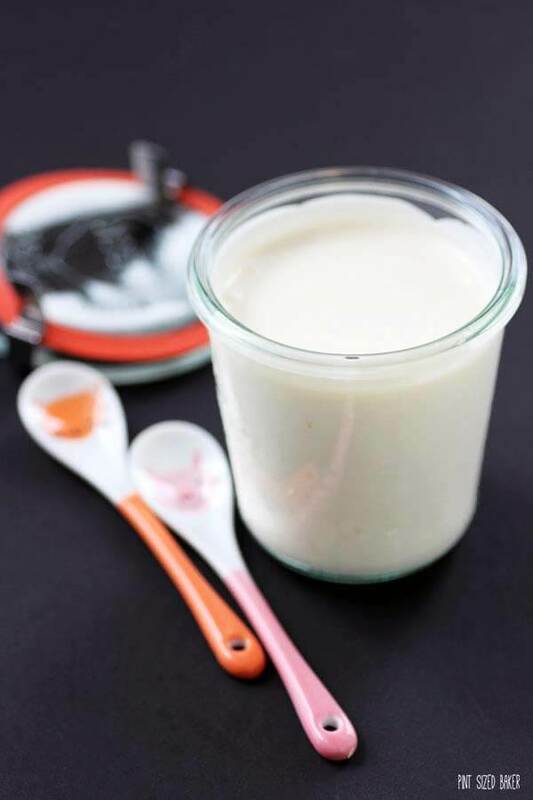 Crème fraîche can be stored in the refrigerator for up to 10 days. Thanks. It was so easy and cheaper then buying it in the store. Amazing! Thanks for sharing at Weekend Potluck! Could you use the buttermilk substitute of milk+ vinegar/ lemon juice to make this? Honestly, I don’t know. I guess if you make your own buttercream it may work but do you get the same enzyme concentration with the homemade version? I’m just not as familiar with it.